BOSTON Sixteen hours after investigators began interrogating him, the surviving suspect in the Boston Marathon bombings went silent: He'd just been read his constitutional rights. Dzhokhar Tsarnaev immediately stopped talking after a magistrate judge and a representative from the U.S. Attorney's office entered his hospital room and gave him his Miranda warning, a U.S. law enforcement source and four officials of both political parties briefed on the interrogation told The Associated Press. They insisted on anonymity because the briefing was private. The Department of Justice said the reading of Tsarnaev's Miranda rights was coordinated with prosecutors, the federal defender, the court reporter, the U.S. Marshal Service and the hospital. Before being advised of his rights, the 19-year-old suspect told authorities that his older brother, Tamerlan Tsarnaev, 26, only recently had recruited him to be part of the attack that detonated pressure-cooker bombs at the marathon finish line, two U.S. officials said. The CIA, however, had named Tamerlan to a terrorist database 18 months ago, a U.S. official told CBS News senior correspondent John Miller. The new disclosure that Tamerlan Tsarnaev was included within a huge, classified database of known and suspected terrorists before the attacks was expected to drive congressional inquiries in coming weeks about whether the Obama administration adequately investigated tips from Russia that Tsarnaev had posed a security threat. Shortly after the bombings, U.S. officials said the intelligence community had no information about threats to the marathon before the April 15 explosions that killed three people and injured more than 260. 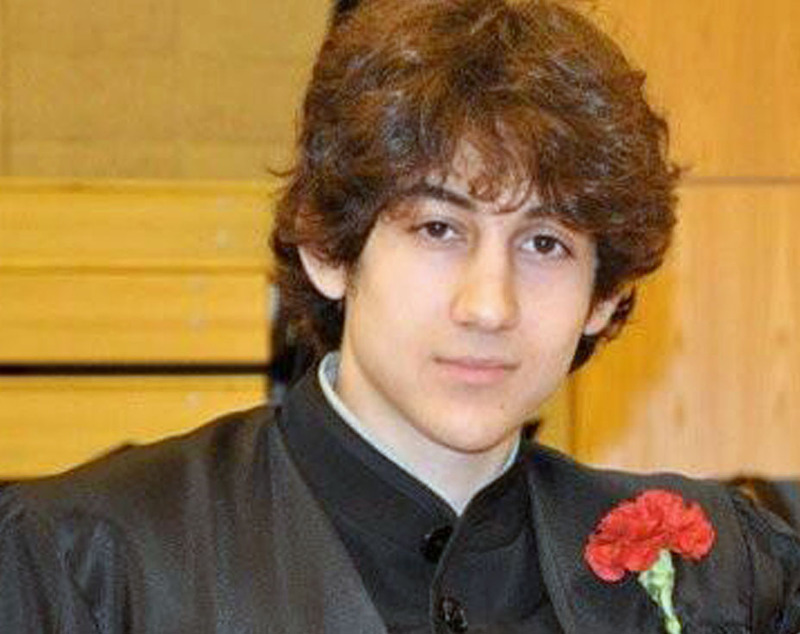 Tsarnaev died Friday in a police shootout hours before Dzhokhar was discovered hiding in a boat in a suburban backyard. Boston police Commissioner Ed Davis had said earlier that shots were fired from inside the boat, but Miller has reported that the suspect was unarmed when captured by police. Police fired upon the boat after one officer on high ground saw the tarp covering the boat flip up and a hand come out holding an object, Miller reports. The officer thought the object was a bomb, prompting him to fire some rounds at the suspect. Other officers believed the object was a gun and the shots came from him, so they fired on the boat. Washington is piecing together what happened and whether there were any unconnected dots buried in U.S. government files that, if connected, could have prevented the bombings. Lawmakers who were briefed by the FBI said they have more questions than answers about the investigation of Tamerlan Tsarnaev. House Judiciary Chairman Bob Goodlatte, R-Va., said lawmakers intend to pursue whether there was a breakdown in information-sharing, though Rep. Adam Schiff, a California Democrat who sits on the House Intelligence Committee, said he "hasn't seen any red flags thus far." U.S. officials were expected to brief the Senate on the investigation Thursday. The suspects' father said Thursday that he is leaving Russia for the United States in the next day or two, but their mother said she was still thinking it over. Anzor Tsarnaev has expressed a desire to go to the U.S. to find out what happened with his sons, defend his hospitalized 19-year-old son Dzhokhar and if possible bring his older son's body back to Russia for burial. Their mother, Zubeidat Tsarnaeva, who was charged with shoplifting in the U.S. last summer, said she has been assured by lawyers that she would not be arrested, but was still deciding whether to go. It is unclear whether the issue of their younger son's constitutional rights will matter since the FBI say he confessed to a witness. U.S. officials also said Wednesday that physical evidence, including a 9 mm handgun and pieces of a remote-control device commonly used in toys, was recovered from the bombing scene. But the debate over whether suspected terrorists should be read their Miranda rights has become a major sticking point in the debate over how best to fight terrorism. Many Republicans, in particular, believe Miranda warnings are designed to build court cases, and only hinder intelligence gathering. Christina DiIorio Sterling, a spokeswoman for U.S. Attorney Carmen Ortiz, said in an email late Wednesday, "This remains an ongoing investigation and we don't have any further comment." Investigators have said the brothers appeared to have been radicalized through jihadist materials on the Internet and have found no evidence tying them to a terrorist group. U.S. investigators traveled to the predominantly Muslim province of Dagestan in Russia and were in contact with the brothers' parents, hoping to gain more information. They are looking into whether Tamerlan, who spent six months in Russia's turbulent Caucasus region in 2012, was influenced by the religious extremists who have waged an insurgency against Russian forces in the area for years. The brothers have roots in Dagestan and neighboring Chechnya but had lived in the U.S. for about a decade. Dzhokhar told the FBI that they were angry about the U.S. wars in Afghanistan and Iraq and the killing of Muslims there, officials said. Dzhokhar's public defender had no comment on the matter Wednesday. His father has called him a "true angel," and an aunt has insisted he's not guilty. Investigators have found pieces of remote-control equipment among the debris and were analyzing them, officials said. One official described the detonator as "close-controlled," meaning it had to be triggered within several blocks of the bombs. That evidence could be key to the court case. And an FBI affidavit said one of the brothers told a carjacking victim during their getaway attempt, "Did you hear about the Boston explosion? I did that." Officials also recovered a 9 mm handgun believed to have been used by Tamerlan from the site of an April 18 gunbattle that injured a Massachusetts Bay Transportation Authority officer, two U.S. officials said. Vice President Joe Biden condemned the bombing suspects as "two twisted, perverted, cowardly, knockoff jihadis" while speaking at a memorial service Wednesday for Sean Collier, a campus police officer at the Massachusetts Institute of Technology who was ambushed in his cruiser three days after the bombing. More than 4,000 mourners paid tribute to the officer. The Office of Health and Human Services in Massachusetts confirmed a Boston Herald report Wednesday that Tamerlan, his wife and toddler daughter had received welfare benefits up until last year, when he became ineligible based on family income. The state also says Tamerlan and his brother received welfare benefits as children through their parents while the family lived in Massachusetts. The area around the marathon finish line was reopened to the public.